Media is a general term that refers to a variety of commonly used tools, whether to communicate or disseminate information to audiences. Social media is basically the latest development of new internet-based web technologies, which make it easy for everyone to communicate, participate, share and network online, so as to disseminate their own content. The development of new media (internet) causes the netizens to have the function of actively participating in the process of value creation, and become the co-producer of the content to be received. Social media, e.g Facebook, is said to be different from the mass media in the context of journalism because everyone has the right to be free to speak out, even if the message conveyed is complaints of communicators who are subjective. 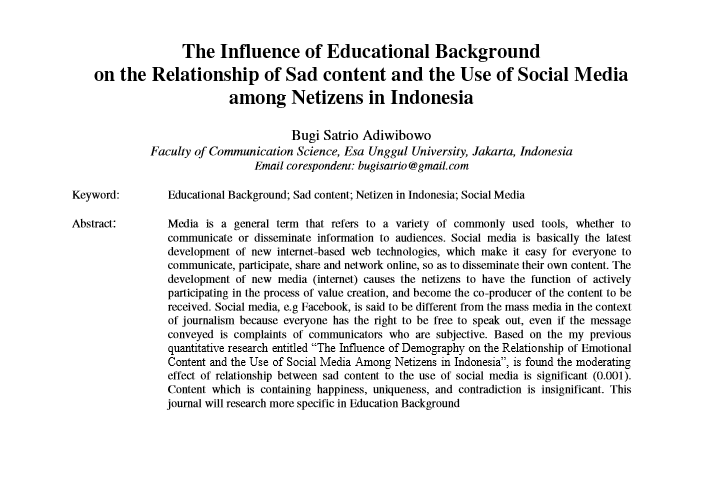 Based on the my previous quantitative research entitled “The Influence of Demography on the Relationship of Emotional Content and the Use of Social Media Among Netizens in Indonesia”, is found the moderating effect of relationship between sad content to the use of social media is significant (0.001). Content which is containing happiness, uniqueness, and contradiction is insignificant. This journal will research more specific in Education Background.